Congress vice president Rahul Gandhi campaigned in central Gujarat including the tribal-dominated district of Chhota Udepur which go to the polls on December 14. Gujarat assembly elections 2017: We will respect the post of prime minister, Rahul Gandhi said. Pavi Jetpur/Tarapur, Gujarat: Congress president-to-be Rahul Gandhi has said his party would not imitate BJP leaders who "abuse" him, and asserted that he would fight over the issues which affect the people of poll-bound Gujarat. "A leader told me that whatever Mani Shankar-ji (Mani Shankar Aiyar) said about (Prime Minister Narendra) Modi was wrong, but what about Modi-ji and people from BJP saying wrong things about you, abusing you, and saying (objectionable things) about you on Internet? I told him he belongs to Congress and not the BJP, so we will not do what they do, we have a history," Mr Gandhi said on Friday. The Congress leader was campaigning in central Gujarat including the tribal-dominated district of Chhota Udepur which go to the polls on December 14. "We will respect the post of prime minister, will continue to fight on issues, will talk about development of Gujarat, and will work for you wholeheartedly," he said. Mr Gandhi's statement comes at a time when his party is facing flak over Mr Aiyar calling PM Modi "neech aadmi" which was mentioned by PM Modi many times in his campaign speeches. The Congress subsequently suspended Mr Aiyar on Thursday evening. 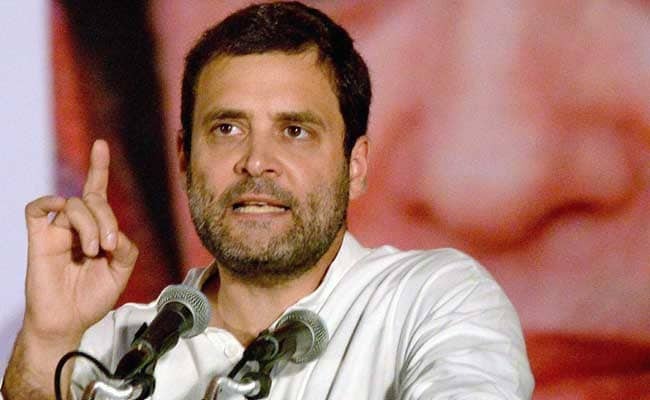 "Modi-ji may distract you, but yesterday I talked to our leaders and they told me frankly that Rahul-ji, Congress is going to win the election in Gujarat, nothing is going to stop this," Mr Gandhi said. Questioning the delay by the ruling party in publishing its manifesto -- which it eventually did this evening Mr Gandhi attacked PM Modi over his statement that the BJP was going to stay in power in Gujarat for 100 years. The Congress prepared its manifesto after consulting various sections of society such as tribal communities, women and youths, and incorporating their demands, Mr Gandhi said. "Modi-ji says his government will stay for 100 years. Look at his arrogance. He will talk about a lot of different things -- Afghanistan, Pakistan, China -- and will take you on a tour of entire world, but will not talk about Gujarat, its development and what happened to Gujarat in 22 years," he said. "Modi-ji will also not talk about (BJP president) Amit Shah's son Jay Shah's corruption or about Rafale fighter jet deal. Modi-ji will also not talk about how much you get for cotton. He will only say BJP will rule Gujarat for 100 years," he added. "What does that mean? It means whatever the people of Gujarat say, Modi-ji has decided that the BJP will rule in Gujarat for 100 years," he said. PM Modi was going to lose in this election because "for 22 years he took from you but gave you nothing", the Congress leader said, adding "when Congress forms the government, we will work to give you your due, help you." Mr Gandhi also accused PM Modi of offering farmers' land to corporates while ignoring demands made by the government. PM Modi gave 45,000 acres of land in Kutch to "one person" at the rate of Rs 1 per sq metre, Mr Gandhi said, naming a prominent industrialist from Gujarat, and added that this person later "sold the same land at Rs 3,000 per sq metre to government companies". "This is Narendra Modi-ji's magic," he said. "But the prime minister-ji will not talk about all this in his speeches. He will not say that he has snatched 6.5 lakh acres of your land to give to five or ten richest people. He will also not tell you that Narmada water cannot reach your farm but will go to factories of five-ten people," he said. Rahul Gandhi, who has visited several temples in the state since the poll campaign began, on Friday visited the Mogal Dham temple at Ranesar in Ahmedabad district. Voting for 89 seats of Saurashtra and south Gujarat will be held on Saturday, while that for 93 seats of north and central Gujarat, including Chhota Udepur, will take place on December 14.